The Snickerdoodle is only 3 so he can't yet read but I like to introduce combinations of words and pictures every chance I get. I figure the more he sees familiar objects labeled, the more likely he'll start to recognize letter patterns and words. 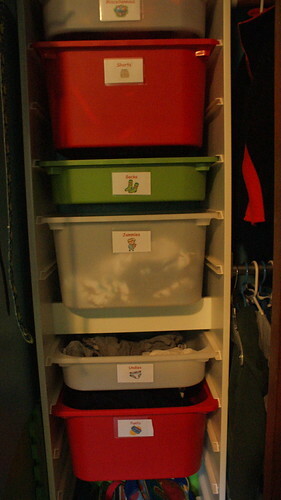 At any rate, I also really love organization so I wanted to share with you how we keep his clothing and toys organized. Believe it or not, this actually works too. This is how I set things up over 2 years ago when we moved into this house and it has remained useful, he even puts his own toys away right. This is a VERY simple system! I merely used stick on business card holders like these then used MS Word to create business card sized labels which are merely printed on plain white paper and trimmed to fit. For each label I included the item name as well as a picture. 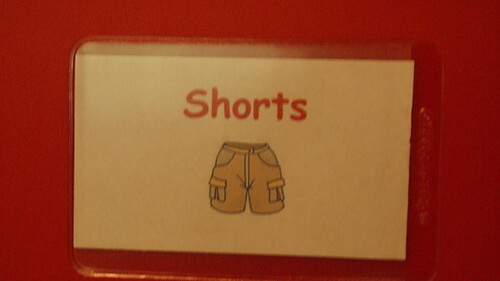 I just used basic Microsoft clip art for each label, I didn't want to get too fancy. As his toys have changed, I've been able to easily switch out labels for new ones and he is able to sort his toys appropriately. Can you believe we even have separate drawers for straight vs curved train tracks? Yep, the system is THAT easy to follow. It's great to see you teaching these brilliant organisational skills to your little one. I did the same for my kids when they were little and it is really paying off now. The labels are a great idea! Thanks Natasha. He's a very organized little guy for the most part and I just pray it sticks. When he was really young, it would bother him if his room wasn't totally picked up before bed and he'd get up in the middle of the night to either put stuff away or wake us to help him . . . UGH. Now he can handle a little chaos (thank goodness) but is really great about putting away his own stuff. 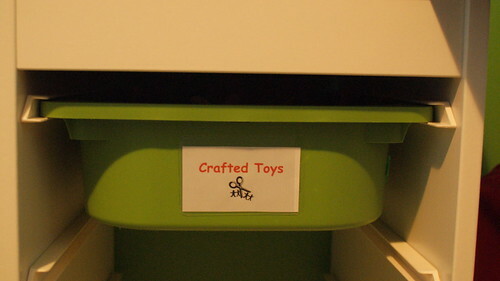 I love the Ikea drawers we have and the drawer labels have been invaluable.